For example, the Middle East stands out for its relatively high levels of social media usage compared with other regions, despite the fact that only one country there, Israel, is an advanced economy. 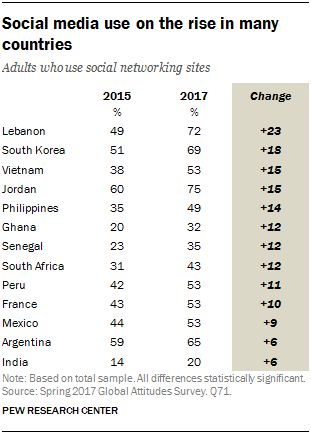 Across the five Middle Eastern and North African countries surveyed, a median of 68% say they use social networking sites. And across the seven Latin American countries surveyed, none of which is considered an advanced economy, 59% use social media, compared with 55% across the 10 European countries surveyed, all considered developed. Some large advanced economies also stand out for relatively low levels of social media use. In particular, in Germany (40%) and Japan (39%), about four-in-ten use social media – similar to the percentages in South Africa (43%) and Tunisia (38%). Just one-in-five adults in India and Tanzania use social networks, and all five sub-Saharan African countries surveyed report social media use below the global median. When looking at social media use among internet users, many countries with relatively limited internet use have seen their share of social media users skyrocket relative to advanced economies. In the Philippines, for example, while overall levels of social media use stand at about half of the population, among internet users, that figure is closer to nine-in-ten (88%). And in Jordan, an astounding 94% of internet users are also on social networking sites. Only 46% of internet users in Germany use social media, the lowest such measure among the countries surveyed. In a few countries, social media adoption rose dramatically between 2015 and 2017. For example, only 49% of Lebanese adults used social media in 2015; in 2017 that number is 72%. Similarly, just two years ago only 51% of South Korean adults were on social media, compared with almost 69% in 2017. Across the globe, younger adults are much more likely to report using social media than their older counterparts. For example, in the Philippines, nearly eight-in-ten adults age 36 and under (78%) are on social media, compared with just two-in-ten older adults – a 58-percentage-point difference. This generational divide is prominent in every country surveyed. Divergent aging patterns might also help explain variations in social media use across certain countries. For example, in Japan and Germany, social networking sites are quite popular among young adults; 82% and 74% of those ages 18 to 36 are on social media, respectively. However, the median age is 47 in both Japan and Germany. There simply aren’t many young adults in these countries. By contrast, like many Arab countries, Lebanon and Jordan are experiencing a “youth bulge”: The median age is 31 in Lebanon and 23 in Jordan. The age differences in these countries aren’t as drastic as in Germany and Japan – a 34-point gap in Lebanon and 8 points in Jordan – but the large youth population contributes to high social media use. In some emerging and developing countries, men are much more likely to use social media – in Tunisia, for example, 49% of men use social networking sites, compared with just 28% of women. However, in advanced countries, social networking is often more popular among women. In the U.S., Spain, Sweden and Israel, women are more likely to use social networking sites, even when accounting for internet use. In Sweden, more women are on social media than men (72% to 63%), even though men are more likely to use the internet than women (94% to 90%). There are significant differences in social media use across other demographic groups. Those with higher levels of education and those with higher incomes are more likely to use social network sites.